Posted 10:41 am by sawatsky-group & filed under Experience, Tips. A modular home is a house that is typically built inside in a factory setting. 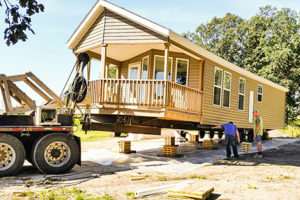 Once the home is completed it is transported by truck to the owner’s location. Basically, a modular home is one that is built off site and shipped to the final location. Since modular homes are built indoors they are immune to weather challenges and can be completed much more quickly and efficiently than typical stick built homes. The typical turnaround time on a modular home is weeks, rather than a year or so with a custom onsite build. Less waste is produced since the build is more controlled, making it a greener solution, while saving money on the final project. The builders have very specific protocols and standards which they are easily able to observe in the factory setting. Building codes are still in place and code standards are exceed by builders that Best Buy Homes works with.